Yoga Vasishtha; Swami Venkatesananda, The Supreme Yoga: Yoga Vasishtha (Delhi, India: Motilal Banarsidass, 2010) p. 52. It is astonishing to me to see how this ancient scripture speaks to our present times. I feel such connection when I read about the great effort it takes to direct the mind. One of the practices that helps me direct my mind is chanting. The effort to focus my mind on the discipline of chanting is very rewarding. It creates an atmosphere of happiness that my mind enjoys. Thank you so much, beloved Gurumayi, for bringing us these timeless scriptures. a Siddha Yogi from New York, USA. Great warmth of gratitude fills me as I settle more deeply into the truth of this teaching. I can see how the understanding of my own Self, of the nature of Shri Guru, has been honed by grace and the practices, and how it has become the color and texture of my mind. I am aware, right now, of my mind as something sacred. And I also know that I will continue to make subtle adjustments in direction, always aiming more completely toward the true north of Shri Guru. At the beginning of the year, I had to give up eating grains. Good bread had always been my comfort food. Whenever I experienced an emotional challenge, I would go to the kitchen and make myself some bread with butter and cheese. Understanding that this was an addiction, I began telling my mind that I would have to exert great effort to abstain from eating bread. I found that the ability to guide my mind in a new direction empowered me. I discovered that overcoming the urge to eat bread was more satisfying than eating bread itself! 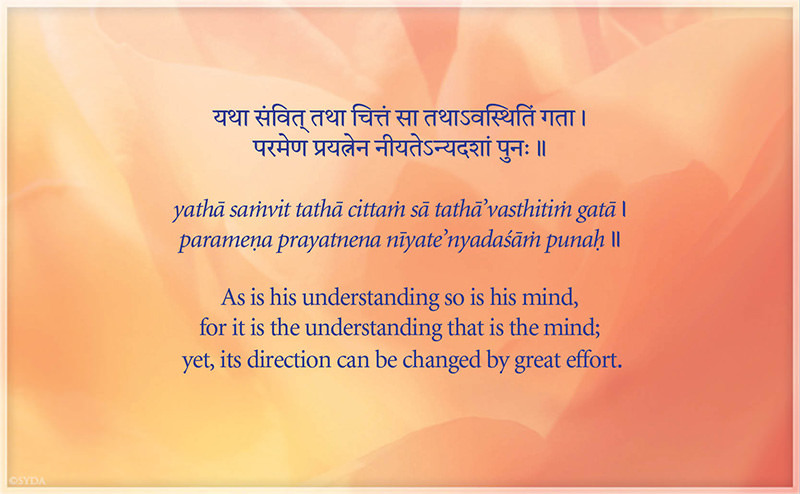 When I am contemplating a sacred text, I like to read the Sanskrit out loud. As I read this verse aloud this morning, I felt an immediate connection with every word. I felt I was home, on familiar territory, among friends. I had a glimpse of the experience of perfection of each one of the four gatekeepers deep within me. I also felt I was enjoying satsang with Vasishtha himself. We were together in my room experiencing this understanding simultaneously. The centuries between us had vanished. I am still brimming with joy from this experience.